A Miller’s Ale House restaurant has been proposed to be built on property under development on U.S. Hwy. 27/441 in Lady Lake. The restaurant will be the subject of a special meeting at 5 p.m. Monday, April 15 before the Lady Lake Commission. 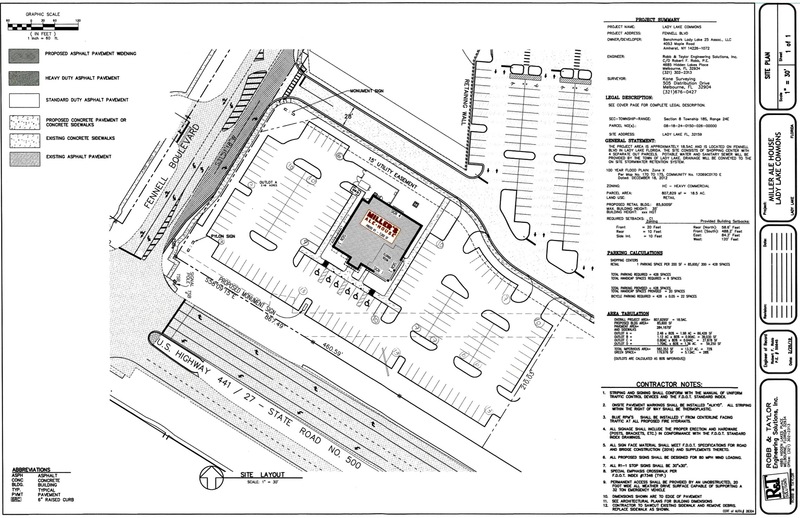 The restaurant would be located on 2.48 acres at the southeast corner of the intersection of Fennell Boulevard and U.S. Hwy. 27/441. The restaurant will be 7,202 square feet with 151 parking spaces, including six handicapped spots. It will have a Mediterranean-style exterior with stacked-stone. A rendering shows the restaurant will include a Florida room. A rendering of the proposed Miller’s Ale House. The Benchmark Group is developing the property purchased about three years ago from the Fennell family, who more than two decades ago made the land available for Lady Lake to build its town hall. The street that runs beside town hall is named Fennell Boulevard. Miller’s Ale House will be part of a development to be called Lady Lake Commons. An overview of the plans for the Miller’s Ale House restaurant. Benchmark has a stellar reputation in Lady Lake, having most recently developed the Texas Roadhouse restaurant and Stein Mart store. Sam’s Club, Best Buy and Bed Bath & Beyond are also part of the Benchmark footprint. Jack and Claire Miller opened the first Miller’s Ale House in 1988 in Jupiter as “a local place to be enjoyed by all walks of life.” It is a casual sports restaurant known for signature hand-breaded, boneless chicken Zingers served with a choice of 16 sauces. It also offers a wine selection and craft beers.